The AccuAir SwitchSpeed Air Management Packages (non leveling) are for people that want the ultimate way to manage or control your air bag suspension system, but don't necessarily need them to level your car automatically. The non leveling systems still manage the height of up to 4 Air Springs and offer uncomplicated installation of your air management components. The SwitchSpeed™ Air Management Packages bring together all of the highest quality components available to operate your Air Springs in one easy to order part number. Choose between one or two compressors for lightning fast recovery times. 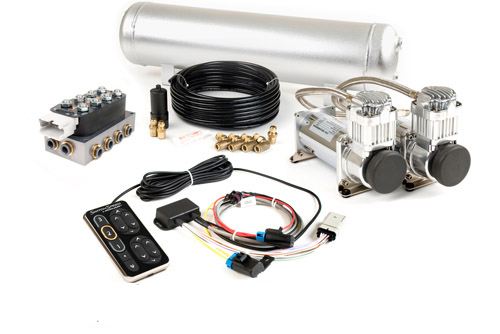 This package includes the SwitchSpeed ™ Controller, VU4 Solenoid Valves, (1 or 2) Viair 400C Compressor(s), 5-Gallon Aluminum Air Tank, aluminum Air-Filter, and D.O.T. Plumbing Kit. This package can be easily upgraded to the e-LevelTM electronic leveling system down the road if desired. • Manual Control of each individual air spring along with front / rear paired adjustments. • Single High Volume Compressor with recovery time (110-150 psi) of 1 minute, 54 seconds. OR Dual High Volume Compressors with recovery time (110-150 psi) of only 52 Seconds. • Anodized Aluminum 5 Gallon Tank that prevents corrosion. • Aluminum Air Filter that prevents debris from entering valves to guarantee reliable valve operation. • D.O.T. Approved Plumbing Kit that guarantees leak-free installation. optional tank pressures (150 /175 / 200 psi) for more reliable air compressor management. • 100% Weather Tolerant for under vehicle mounting. • Each System is 100% Factory Tested. Add Electronic Tank Pressure Switch? Upgrade to Dual Viair 400c Air Compressors? Add EXO Mount for Compressors? 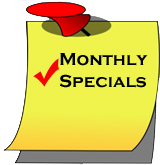 AccuAir SwitchSpeed Air Management Packages!